Leister Productions’ genealogy application, Reunion, has always been an easy-to-use, intelligently-designed tool for collecting and cataloging ancestry information. Reunion 10 is no different, adding useful features to an already excellent product and making it that much easier to keep track of who you are and where you came from. As has always been the case with Reunion, data entry is exceedingly easy. When starting with a new blank database, the application opens in a Family View that displays several blue and pink boxes and asks you to add either a new male or female person to your database. Once you add your first family member, inserting additional family members is as simple as clicking a pink or blue box, either up or down your family tree, and entering that person’s information. The initial data entry process is so simple that you can create a fairly extensive family tree—sans detailed information—in a matter of minutes. Who Am I? : Reunion 10 makes collecting, updating, and viewing your family history simple and fun. If you’ve used Reunion in the past you’ll find little has changed with regard to the overall user experience, but you will find a number of enhancements and refinements. 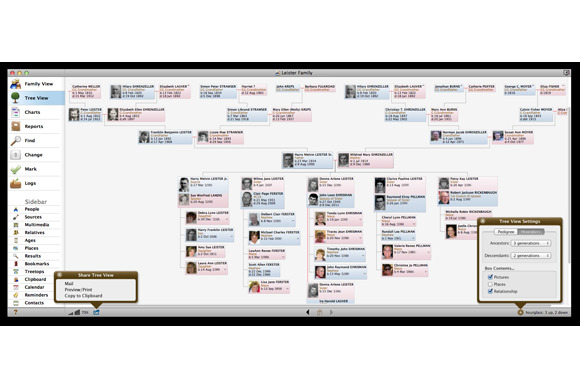 First, Reunion has a new navigation Sidebar at the right of the main Reunion window that displays a searchable list of all your family members. Selecting any family member from within this list sets the focus of Reunion’s main window to the person you’ve selected. You can drag anyone who appears in the Sidebar on top of anyone appearing the Family View window and have a parent/child relationship created between those two people. The left side of the main window now includes a feature called the Navbar, a set of shortcuts that provide quick access to several of Reunion’s major features. Using the Navbar, you can quickly switch between a Tree and Family view of your family data and gain quick access to tools for creating charts and reports. At the bottom left of the main window is a menu that changes the type of data displayed in the Sidebar on the right of the screen. For example, you can select Sources to see where you collected information for a selected family member or you can select Multimedia to see all the photos you’ve collected for a particular family member. While I like this feature, I did find the placement of the Sidebar menu to be a bit odd and would have preferred that it was somewhere closer to the data being displayed. Leister Productions has made it much easier to add and manage images and other media you’ve added to your family database. Pictures now appear in all views of your family data and can be resized so they are easier to view. Clicking a photo for a family member displays a window containing all the media associated with that family member, and a multimedia usage report lets you see the files you have stored in your database, their size, and lets you see which of your family members are linked with what media files. Reunion 10 includes some interesting new reports, one called On This Date and another called Obituary Report. On This Date lets you view the events in a selected family member’s life based upon a selected date. For example, if you want to know how many living relatives your uncle had the day he got married, you can select your uncle and then use the Reference Date menu to select the date of his marriage and you would see a complete listing of all your uncle’s living relatives at that time. The Obituary Report uses information you’ve entered for an individual (including spouses, children, and other relatives) to create an obituary for that person as it might appear in the newspaper. The purpose of this report is to give you something to compare to a real obituary to help you find information that you may have missed when looking at an original obituary by itself. The only complaint I have with Reunion is how easy it is to delete media files associated with a family member. Click a photo for a family member and press the delete key and the media file disappears without a warning and without an undo option. Not a very friendly feature for what is otherwise a superior application. Reunion 10 remains the best genealogy tool I’ve had the pleasure to use. 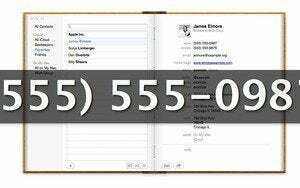 Simple data entry married with a number of ways to view, report, and present your information make Reunion 10 the only way you’ll want to collect, manage, and create your family’s history. With its simple data entry, multiple data views and reports, Reunion 10 is one of the best genealogy apps for your Mac.